Despite its somewhat off-putting name, crown of thorns is a very pretty succulent plant that can bloom almost year round, even indoors. Although crown of thorns can grow into a woody shrub, it is also an ideal houseplant for most homes. It likes the same room temperature that people enjoy and it can handle the lack of humidity prevalent in most homes during the winter. The name Crown of Thorns is derived from the belief by some that the crown of thorns worn by Jesus Christ at his crucifixion was made from stems of this plant. Caution: Besides the sharp black thorns on its main branches and stems, the sticky, latex sap from broken leaves and stems can be a skin and eye irritant. If ingested, all parts of the plant are toxic to people and pets. Leaves - The thick, bright green leaves grow along the new stem growth. Flowers - The true flowers are small and green, surrounded by showy bracts in red, orange, pink, yellow or white. Crown of thorns is only perennial in USDA Hardiness Zones 9 - 11. In colder climates, it is often grown as a houseplant. As with most flowering plants, the better the sun exposure, the more blooms you will get. However, crown of thorns will reliably bloom as long as it gets at least 3 - 4 hours of bright, direct sunlight per day. Outdoors, aim for a spot full sun. Indoors, place your plant in a west or south facing winter during winter. Crown of thorns will repeat bloom throughout the year. The actual flowers are the insignificant green centers, but they are surrounded by showy bracts that look like colorful petals. Outdoors, crown of thorns will grow into a shrub reaching 3 - 6 ft. tall. As a houseplant, expect it to reach only about 2 ft. in height. Despite its thorns, crown of thorns is easy to handle if you grab it by its leafy stems or hold it by its roots. Most modern crown of thorns are hybrids and are not started from seed. However, they are easy to propagate from tip cuttings. To limit the amount of sap you come in contact with, wear gloves and dip each cutting into warm water, letting them sit in it for a couple of minutes. Then lay them out to dry and callus over for a few days before planting. If growing outdoors, plant in well-draining soil and full sun. In dry climates, the plants will appreciate some mid-day shade. Crown of thorns is a very adaptable houseplant. It needs a well draining potting mix and should not be planted in a container that is more than about an inch or two larger than the root ball. If there is excess soil, it will retain water and could cause the roots to rot. At least half a day of sunlight is its other major requirement. Temperature wise, a comfortable 65-75 F. (18-24 C.) degrees F. is good. Don’t worry if you lower the thermostat at night, Crown of thorns can handle temperatures down to 50 F. (10 C.). Since it is a succulent, crown of thorns is very forgiving about water. Water when the soil feels dry about 1 inch below the surface. Water thoroughly and allow any excess to drain off. Do not let your plant sit in water or wet soil for prolonged periods of time or the roots will rot. 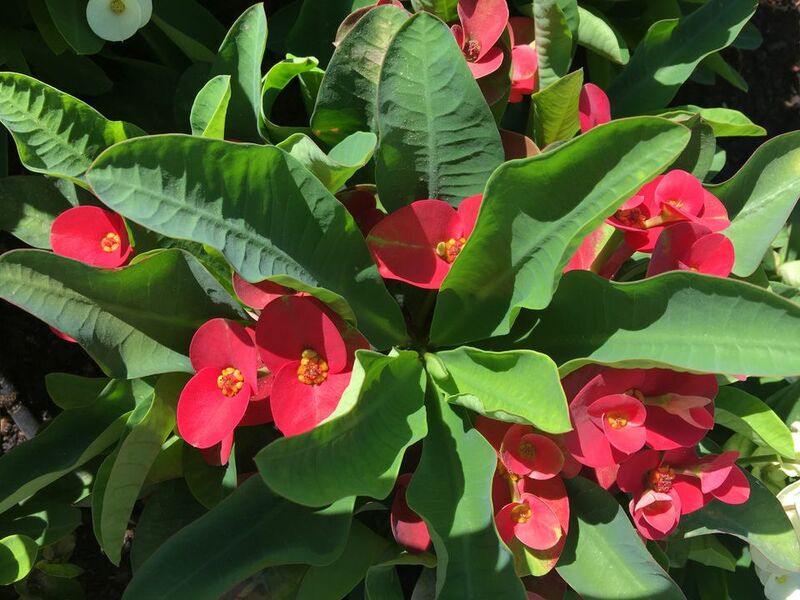 From spring through fall, feed your Crown of Thorns with a balanced houseplant fertilizer. You can do this every other time you water if you dilute the fertilizer to half strength. Crown of thorns will go semi-dormant in the winter and need less frequent watering and not food. Hybridizers continue to come out with flashy new varieties. Look for a plant that is in bloom, so you will know exactly what you are getting. Local nurseries generally only carry a few varieties and mail-order catalogs are a good place to look for unusual hybrids. Here are some to try. “Brush Fire” - Thick, fleshy leaves and bright red flowers. “Creme Supreme” - Strappy leaves and creamy white flowers. "Short and Sweet" - Pretty red flowers on a plant that tops out at 12 - 18 inches tall. California Hybrids - Bred for thick stems and large flowers. They are sometimes labeled Giant Crown of Thorns. Two good cultivars are "Rosalie and "Saturnus." Good for growing outdoors. Thai Giants - Bred for larger flowers, they also have larger thorns. Bloom is not as profuse as the species. Give the plant plenty of room outdoors. You do not want to accidentally back into it. Crown of thorns makes an excellent specimen plant. Give it some renewal pruning at the end of the season, cutting away any older, fading leaves to encourage new growth. Container grown crown of thorns can spend the summer out of doors wherever you need color or interest. Be sure to bring it inside before nighttime temperatures dip below 50 degrees F.
Of course, you can keep your crown of thorns indoors all year. In a bright window, it will perk up any season. Most pests steer clear of this toxic plant, however common houseplant pests, such as scale, mealybug, and thrips may be a problem. Watch for fungal diseases such as botrytis and leaf spotting diseases as well as root rot. Allowing the soil to dry before watering again will help avoid these problems.